Right from the early days, Steven has witnessed how the chamber has grown throughout the years. For more information on the Council nominations process and timeline, please follow this link. If you’re interested but want to know more about being a Council member, or standing for President, contact Glenn for an informal discussion. I have been a council member since 2005 I think , when I got myself involved in the workings of the chamber following my wife, Louise, stepping down as president (2001-2003). From that moment, I was actively involved in the chamber; you can only get out of it whatever you put in. The chamber was more than I ever expected, more time, completely action oriented and dynamic but also a true sense of fulfilment and it was great to see the results of the time consuming hard work come to fruition. Being part of the chamber increases your personal profile enormously. Being part of the root and branch reform and being recognised as the leading British Chamber of Commerce in the EU showed we were on the right track. Beforehand, the chamber suffered an identity crisis and struggled to find where it stood in Brussels. It was less ambitious than other chambers, shared a business centre with only a corridor as the Chief Executive’s office, and lacked confidence. It would never have even attempted to organise an event like the Ambassadors’ Gala. There has been a fundamental change in the way that the chamber thinks of itself, the way the chamber is run and the way that the chamber is recognised not only in the EU Bubble, but in Europe too – so much so that it is outgrowing its current offices and plans to expand. It is increasingly viewed as an international chamber, more than just British. The chamber has doubled in size since my presidency; increased in quality, ability, experience, self-confidence and, most important of all, ambition. Credit must of course also go to Glynis who has successfully built on my two years as president and Glenn for enduring both of us! At the end of my presidency, we had won the annual COBCOE Chamber of the Year (along with two other awards) and have won awards every year since. We also won the European Trade Federation of the year.We then again won chamber of the year last year. It shows that what we’re doing is being recognised by our peers and what we’re doing is great for the chamber and its reputation. I enjoyed the events which opened our new offices here in Madou. A lot of work went into these premises; I couldn’t begin to tell you how many offices and buildings that Glenn and I went to visit. It was a lot of work and very time consuming but seeing where the chamber is four years later, it’s certainly been worth it. Another sign that the chamber has grown is in the elections for Council and the President too. The year Glynis was elected was the first year ever in the history of the chamber that the presidency was contested by more than one candidate. In addition, multinationals also felt it was worth their while to nominate candidates for the chairs of committees, standing against the consultancies that have historically peopled the committees. It is great having elections and that air of competition. It also demonstrates that the chamber is valued by its members, and rightly so. 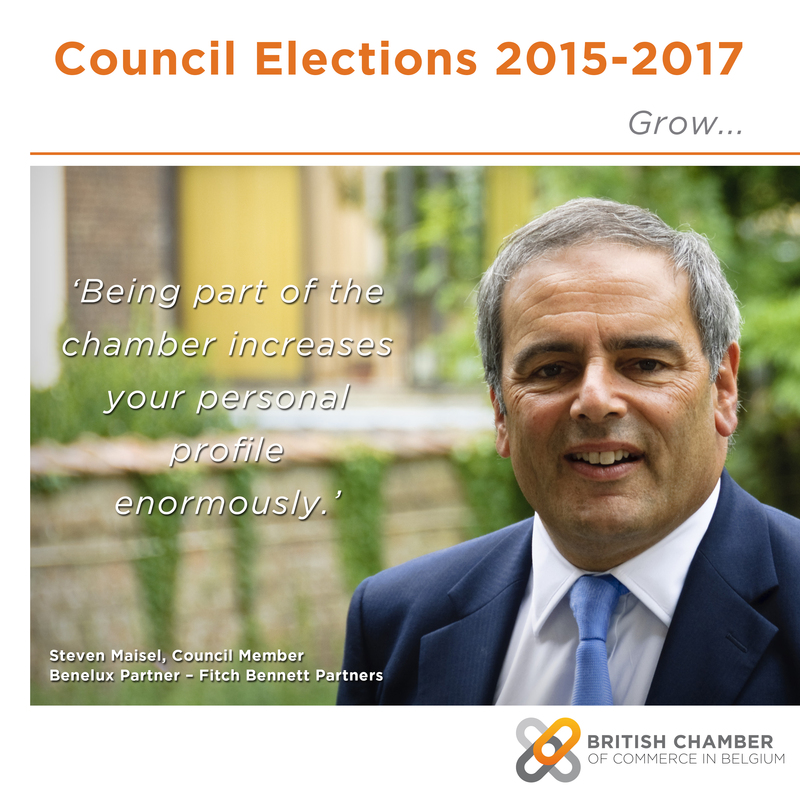 The British Chamber of Commerce in Belgium is an exciting place to be part of and its members recognise that. A lot of progress has been made and is continuing to be made.